Some of my odd experiences were amazing moments that I'll always cherish. Others made me want to curl up, cry, and teleport back to the comfort and gluttony of Florida. Much of my time fell somewhere in between the two. Here are a few select, distinct Israel experiences. 1. Yom Kippur. We arrived on a holiday (Rosh Hashanah) and quickly learned that holidays are serious in Israel. Businesses shut down and we ate the hotel out of their cold sandwiches. When Yom Kippur approached, we had an idea of what was coming since we'd already survived a holiday and Saturdays, but this time, we also had the two days off work. Instantly we wanted to plan parties and sightseeing trips, until we found out that we were off work because the arena would be locked up, without staff, and without electricity. Bye bye, ice! Bye bye to modern transportation as well - no cars, busses, trains, or tractors. With our hotel on the fringe of Tel Aviv, I worried we'd have a hotel lockdown situation where I'd need to request padded walls. But thankfully, bike rentals came to our salvation. While businesses may have been closed, the beach and buildings - old and new - stayed open for photo opps. In addition to the beautiful beach and Old Jaffa, a historic area, the experience turned out to be unexpectedly surreal. With no cars allowed on the roads, including major highways, we could ride our bikes freely through the typically bumper-to-bumper 6-lane roads. Just a day earlier, we had been on a bus, crawling along that road through all the traffic, honking horns, and motorcycles whizzing between the lanes. Then the streets transformed into our personal playground - no honking, no diesel fumes - just open roads for biking, walking, and laying down. And although the businesses were closed, the streets were filled with life. People of all ages were walking, scooting, riding bikes, and scraping their knees. The days were beyond refreshing, being part of a time where our only responsibilities were to enjoy the sunny weather with friends and family. There was no stress in the air, no clash of cultures, just people living their lives. I'd love to see a day like this is the US, but I can only imagine the horrible outcry. How dare you force me to have a day off work and enjoy the company of my friends and family, while I can only use my legs for transportation?! 2. The Dead Sea. I remember when I first learned about The Dead Sea as I child, I was instantly fascinated that people naturally float in the water because it is so salty. For that fact alone, I had always wanted to go there and experience it. I've always liked beaches and pools, but I've never liked swimming or putting my head under water. My years of swimming lessons ended when we got to diving, and I wasn't allowed to plug my nose with one hand. I knew The Dead Sea was the perfect body of water for me. When I learned our show would be going to Israel, my main goal was to make the dream of visiting The Dead Sea a reality. Thankfully, I did. With such hype and years of thinking about it, I prayed that I'd actually float. Things got bizarre before we even got to the water. The landscape in more like that of Mars than anything I've seen on earth. No plants, no visible life, just rolling hills and mountains of desolate, rocky, thirsty land. And as our bus traversed through the harsh terrain into the sea's valley, we also passed an elevation sign for sea level. That would have been normal enough, except the highway was still on a steep decline, and The Dead Sea was far in the distance, far below that sea level sign. We had another 1,100 feet to go to reach the lowest point on earth. It just didn't make sense. When we arrived on it's rocky banks, we frolicked into the thick water. Each person who discovered they floated shrieked and giggled, and The Dead Sea quickly came to life with 50 Hens on Ice birds clucking and cackling in disbelief. Floating in a natural body of water went against everything I'd ever learned, and it was amazing. Just keep any droplet of that water out of your eyes, mouth, or open cuts. To add more to the unbelievable experience, the water gives an unmatched burn and taste that caused a few clucks or agony. 3. Reading from right to left. Not only is the Hebrew script completely unrecognizable to me, it is also read in the opposite direction of my native language. Since I don't understand a lick of Hebrew, it doesn't make any difference, except that I like to pretend that I know what's going on. In a foreign land, I try to blend into my surroundings. Nothing says, "I don't go here," like grabbing a menu and flipping it around 3 times, still unsure which way the binding should face and what is up, down, left, and right. I'll have a small graffiti with a side of street art. The general demeanor in Israel was a little more harsh than in my own country, so I sometimes felt I might have been doing something wrong even if I wasn't. I was trying to navigate through a crowded area. We put 5 people in a 4-person taxi. I needed to pay my bill. I laughed in the lobby bar. I wanted to get into the stairwell that was being blocked by a standing person. I wanted to get through a door that was being blocked by a standing person. 5. Israel's idea of a zamboni. A zamboni is a machine that drives on ice while also smoothing it, making the ice perfect to skate on again after it's been torn up my blades and toe picks. On oversees tours, we typically have a miniature zamboni-like machine that travels with us, and helps smooth out the varying ice conditions. 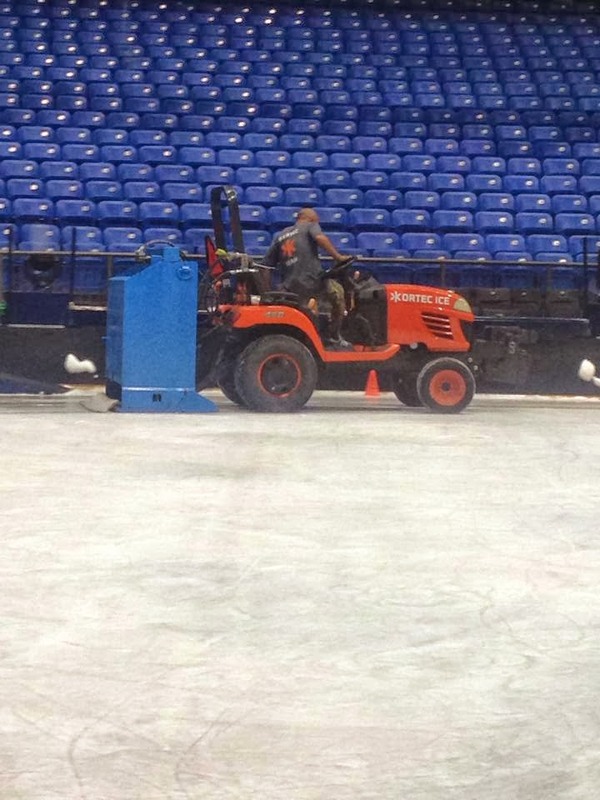 But one of those zamboni minis didn't make it to us in Israel. Instead, we were at the mercy of an Israeli ice-cleaning apparatus - a tractor with a rectangular box on the back that had a limited water supply and nothing to effectively scrape the ice. 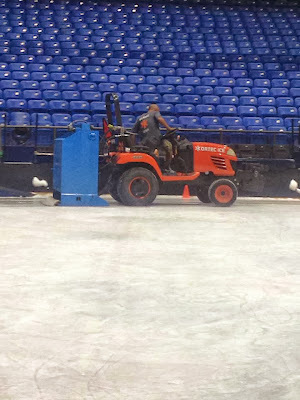 So during the breaks in rehearsals for the ice to be resurfaced, we watched a tractor drive around our little rectangle of ice for 20 minutes, leaving the ice's gouges and ruts in tact. It was like skating on a frozen pond, except without the romance or recreational value. But at least we could make our mark - with every fall, a think layer of our pants and/or skin clung to the ice as we peeled ourselves up. Thank you, Tel Aviv! Tractorboni. Thanks for sharing, Audra! Read more on Israel! Shalom Part II - The Hunger Games and Shalom Part I - Bienvenidos a Israel. Tired of Israel? Read the latest on Britney Spears!